I am working on an improved Huxley design. This is slower than I'd like, owing to lack of time, but it's coming together. It's all being done in OpenSCAD - the files are in the RepRap svn repository under huxley. It uses printed sliding bearings that are screw adjustable, so they always fit exactly. Further, you can compensate for wear. Rhys has found a very high torque NEMA 11 motor which I hope to use for my microextruder for it. I'm trying to design it for ease of assembly. In particular, I'm trying to get it so that you can put things together in just about any order, and so that you don't have to take four things off to extract and replace a fifth. The first version will have a moving Y platform, like Mendel. But MakerBot have taken Ed Sells' idea of building on a conveyor belt and made it work, so I think replacing the Y motion with a belt will follow soon after. As ever, I'm constantly on the look out for nice conducting materials. I recently stumbled across a special powdered Nickel. What’s particularly interesting about it is that it is dendritic i.e. the particles are spiky rather than spherical. Essentially this means that when mixed with a polymer, the metal particles are more likely to touch each other so it therefore gives a much lower resistance. A colleague and I crudely made a thin film that measures 100x100x1mm out of this powder mixed with liquid latex in a 1:1 ratio in terms of weight. The paste seemed sufficiently viscous that we could extrude it with a paste extruder. We embedded 9 electrodes in the film so that we could get repeatable readings. The total resistance between opposite electrodes came in at 0.8ohms, which is about a 9cm length spanning the film. I guess this is sufficiently low to be useful for a lot of low current applications. I've recently been experimenting with the loading of various fibres into CAPA and PLA. This started out as simple strengthening for the 3mm PLA that I sell, but the addition of 20 micron x 1mm nickel fibres makes it conductive. Dunno how useful this will be yet but it certainly allows RFI shields to be printed. Then I hit on a brainwave: short polyacrylonitrile fibres. There are normally used to reinforce synthetic rubber. But they have another use: The feedstock for carbon fibre. My trick is to mix polyacrylonitrile and similar materials in with PLA or CAPA. This is then turned into filament, which in turn is printed into an object on a RepRap - this tends to align the fibres. 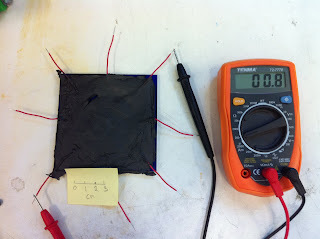 The object is then encased in a ceramic and heated to the vapourisation point of the PLA or CAPA. You then have a ceramic mould stuffed with oriented polyacrylonitrile. Introduce an inert atmosphere and raise the temperature and you have a mould full of carbon fibre. This can be surface-activated in the usual ways, or coated with vapour deposition before being vacuum-encased in epoxy to form a complex, 3D carbon fibre composite object. 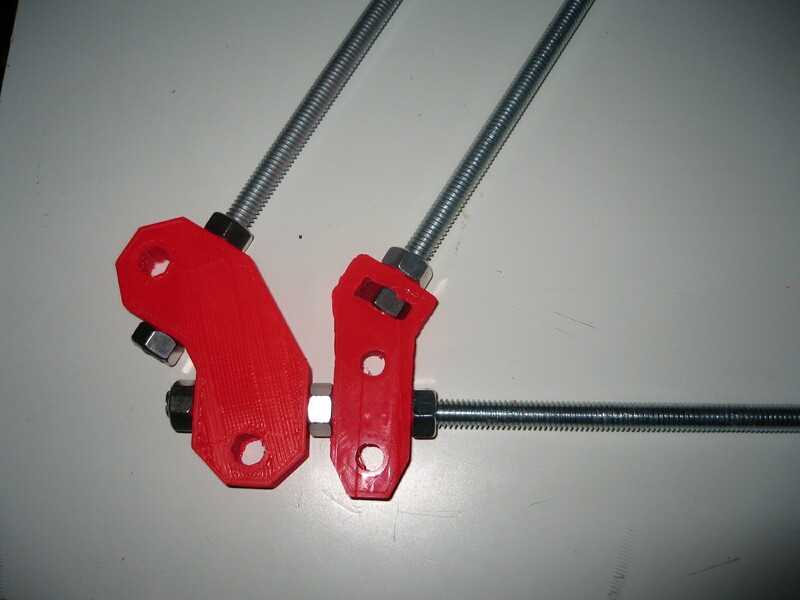 Two weeks ago, Rob posted about some of the awesome stuff we've been doing with the Hacklab Reprap, a Prusa fork. I thought it might be worth while to bring everyone up to speed on what has happened since. 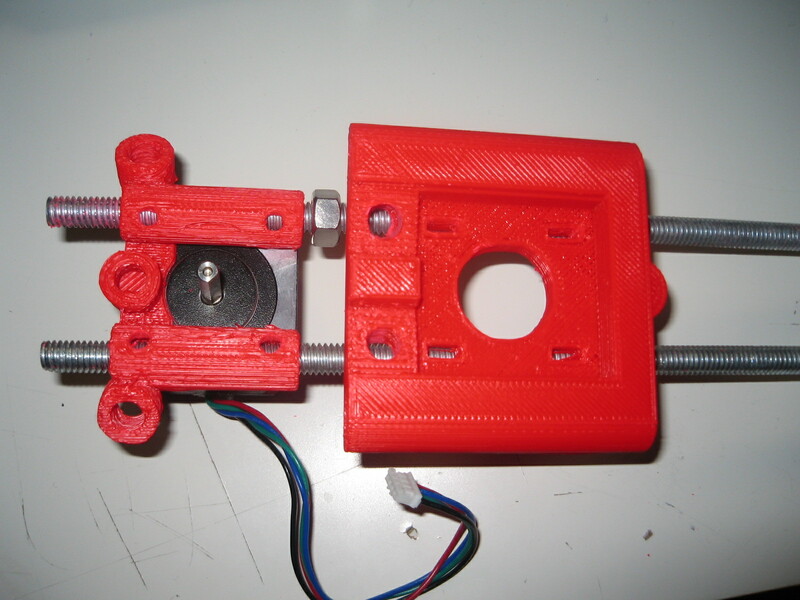 A ground up redesign of z-motor-mount. It reduces the build time from 1 hour and 20 minutes to 30 minutes. It reduces the part count by two and gets rid of one rod. New designs of y-end-* reduce part count and build time. 3d printed nuts. You can also watch a video of them. Pics of y-end-* designed for threaded rod instead of belts, though this feature is in hiatus for now. 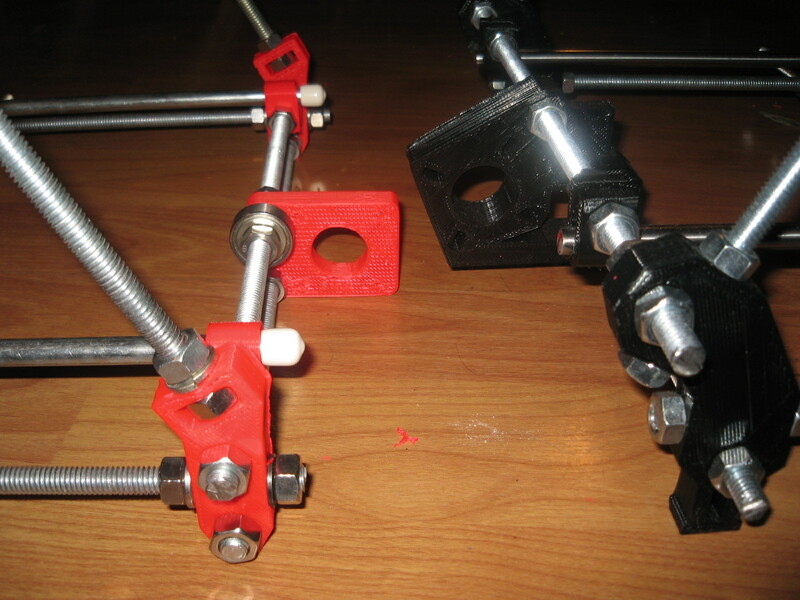 There is now a mailing list for hacklab-reprap. I have started to design a MicroExtruder for 1.8mm filament. 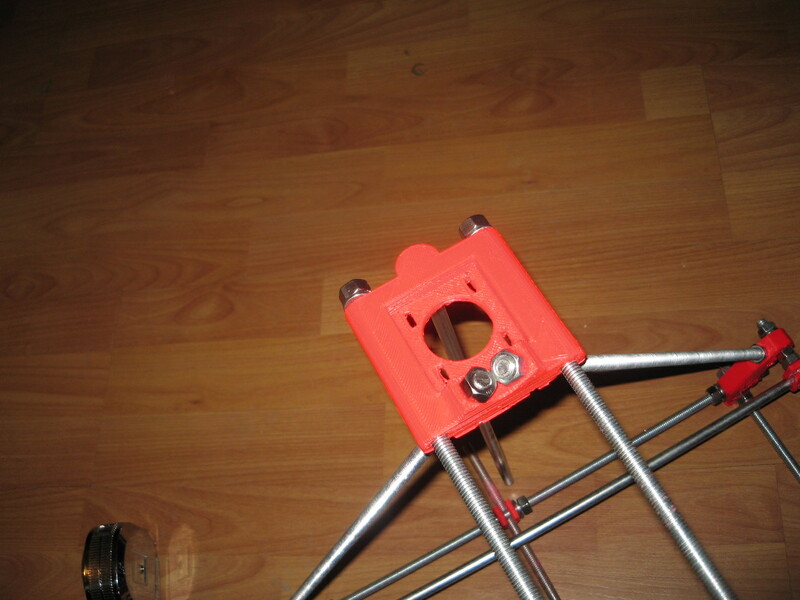 So far I have just got the non-reprapped parts, shown above. As you can see, it is about the size of the two end joints of my index finger. It is a miniaturised version of my standard extruder here, which was based on ideas from Nophead and others, with bits from me. From the top there is the filament (green - thanks Vik!) then a length of 8mm diameter PTFE. This screws into the brass nozzle with an M6 thread. There is then a PEEK disc with two 2mm holes either side. Those will take two M2-threaded rods. The tension in these will resist the extrude pressure. The brass nozzle is threaded M4, and screws into a small brass heater block. This takes the normal RepRap thermistor for temperature measurement, and is heated by an 8.2 ohm metal-film resistor rated up to 235 oC, which should give 16 watts at 12 volts. The filament hole down the PTFE and brass is 2mm in diameter. Full details in Chris's post..